In the reserved skillet, melt the remaining 2 tablespoons butter. Whisk in the flour and cook for 1 minute. Whisk in the vinegar, then the orange juice, then the remaining 1 cup chicken broth; simmer until slightly reduced, 2-3 minutes. Stir in any juices from the chicken; season with salt and pepper. In Recipes-list.com we have selected the most viewed recipes from category - uncategorized . Enjoy the best recipes specially selected for you! 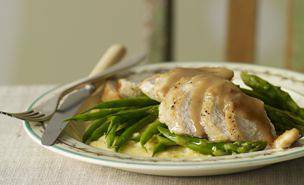 Orange-Balsamic Chicken with Asparagus, Green Beans and Polenta is the right choice that will satisfy all your claims.